Millions of people have embraced both bullet and guided journals as a means of organizing their daily lives. 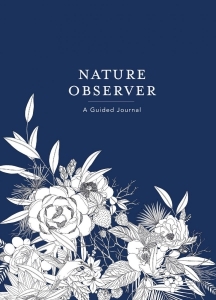 Nature Observer combines the best of both trends, and the result is an agenda-like structure packed with prompts that encourage organization, creativity, and mindfulness. For nature lovers seeking a greater appreciation of the world around them, Nature Observer follows the seasons, provides reminders to appreciate the outdoors during particular moments of beauty, and features creative exercises inspired by the natural world. This high-end journal has all the bells and whistles—a dot-grid on high-quality bleed-proof paper, a ribbon marker, lay-flat binding, and an elastic closure. The Nature Observer is for note takers, list makers, and nature lovers! Combining the popular style and structure of bullet journals with guided, creative prompts, it will help you slow down, track your time, and celebrate the natural world.